Faster than lightspeed travel is rather like closing one's eyes and wishing you were someplace else - the outside world is shut out almost completely. There is no light to be perceived. No sound. No concept of heat. Thus, when INDRA finally emerges from its voyage, the previous darkness only serves to augment the spectacular sight of Ur-Kal. 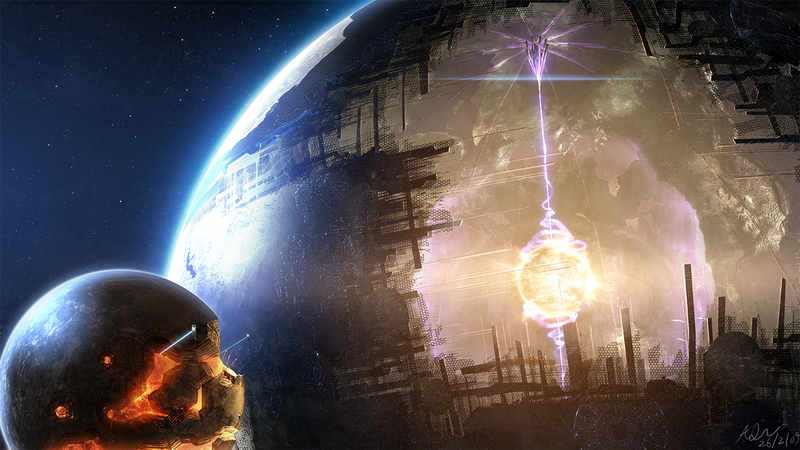 The great Dyson Sphere, located near the centre of the galaxy, Ur-Kal is the seat of the galaxy's primary governing body, and a testament to the ingenuity of is participant races, and their drive to unite together under a dream of a better future. A part of the sphere's material has been left deliberately see-through and visible - and the sight of the young yellow sun within the sphere is one of the most striking sights in the universe. A work of art and perfect function, that dwarfs even planets... it fills you with a sense of insignificance, yet also a strange hope. As you approach the sphere's surface, its majesty slowly gives way to bustle, bringing back a sense of normalcy with it. Countless ships fly over the surface of the sphere - 'there isn't a soul in this galaxy that doesn't have some business in Ur-Kal', common wisdom suggests, and it may very well be right. Landing is a surprisingly simple affair - INDRA is repeatedly scanned as it descends to the surface, and by the point it touches ground, the party has already been granted access to the megalopolis that has grown to cover the sphere. Cadence addresses the group cheerfully as she opens the discussion, "So... Marek has to go do boring stuff. What do you all want to do!? I can't wait to see this place! I hope it's half as amazing as Galeria was..."
"Go amuse yourself," Sakra says brusquely. Blinking, Vaz'kar opts to encourage Cadence's immaturity this time, "Kid, you have a whole lot of universe to see. Bright side, this is a good place to see a lot of it." "Need to see about getting my gear in order after that... war we just got through. Can't ever be too prepared, yeah? I'll be in contact though, I still got a lot of investment in this business of ours. I guess you guys still do, too? Hit me up if you ever need the help. I know we just kinda got picked up along the way while most of you were already on business together, but we'd work with you guys again if you ever needed it. We all did good. Real, legitimate good." Turning to look at Tank, at the somehow conscious shell that held the young Lilimian inside, Vaz'kar echoed the theme of teamwork the robot addressed, "If I need someone to punch something for me, I'll... well, I probably won't bother to contact you. But you fought well. You earned my respect for that." He tried to anyway, teamwork was never exactly Vaz'kar's strong point. A second voice came out the robot, that of Adel, responded animatedly, "Funny you should mention that, we've been reading up on Human kung fu comics! We can fight like real viking-samurai now, I bet!" "Aww... Vaz... Tank, Adel... you're leaving?" Cadence pouts at them, with audible sadness in her voice. "...Will be in contact, like I said. Too much has happened to not stick to our routine. Get into a big fight, get our stuff in order before anything else. If something goes down, and something ALWAYS goes down, we need to be ready." Adel's attempt to assuage Cadence's feelings is cut-off by Tank, and the group can almost hear Adel's pout in response. "I need to check the news, see if I can pick up any reports on the pirates I was interested in near Galeria. That place was lousy for updating it's Datalinks. And explore how this trial is going to work. It's too important to leave to chance." Vaz'kar doesn't wait for any further interruptions before leaving the ship. Approaching a nearby free datalink terminal, he begins to search for information on pirate attacks matching the MO of the band he was investigating - those where the attacked ship is attacked for it's components and then left to float in space, inoperable. Expecting to find few if any results, Vaz'kar is stunned when the terminal starts feeding back scores of reports. Indeed, the problem isn't finding reports of such attacks - it's finding too many of them. Based off what Vaz'kar knew before there are only two possibilities - either the pirates have massively expanded their operations, or the Galería area is a piratical minefield. Knowing he would have to narrow the search down further, he begins looking for reports of sighted Aerians. This still gives him eight dozen reports to look through, but only three that can be verified here at the Kal - the victims are currently present within the city. Looking into the three victims, Vaz'kar discovers one of them is a bigshot Aerian business mogul, Endar Spier with a residence in one of the ritzy city districts. His stature would make it hard to get in touch with him. The second is a small space skiff owner, Hardan Muro - no info is available on him, besides his name and residence, not far off from the starport, as he is apparently a rather reclusive individual. The third, and last one, is a name that rather rings a bell upon Vaz'kar's reading - an old childhood friend, whom he lost contact with a while ago. Endar Spier would be a tough person to get hold of, so Vaz'kar sent a message, hoping to get the ball rolling at least, asking if he would be interested in the services of a notary. To his surprise the reply is quite prompt. "Yes, as soon as possible." Spier is something of a minor celebrity - known as the Owl-Sight, because he sees clearly in the darkest nights to make the right decision - he is likely to the kind of guy with a sizeable enough ego to want a notary to record something concerning him. Determined not to throw away the opportunity, Vaz'kar boards the magrail towards Spier's home. When he gets off at the station, a Kineth approaches him. "Mister Vaz'kar?" The blue-skinned humanoid asks. "Owl-Sight is expecting you. Please, follow me." Surprisingly enough, Spier's home is underground. The secretary (so she...or at least Vaz'kar thinks it's a she, introduces herself) leads you into Spier's residence, down a spiral staircase, and into a small living room covered in wood and bookshelves. It's in almost complete darkness, but you see the owlish Aerian sitting on a padded chair. "You're the notary," he says. It's not a question. Vaz'kar nods, "Endar Spier. I know you by reputation." "I'm afraid I can't say the same of you. My apologies." Spier says, nodding in recognition. He sounds sincere as he says so, oddly enough. He has a very quiet voice, almost as though it has been barely used. "Are you ready to begin? Business should always be brisk." He doesn't sound impatient...the words feel well-worn, as though he's uttered them many times before. "This job requires always being ready. Proceed when you will." Spier nods again. "Very well then. Pay close attention, because I will say this only once." "Eight. Two. One. Eight. Zero. Four. Nine. Five. Three. Five. Two. Seven. One. Three. Two. Two. Eight. Five. Zero." He enunciates clearly, if a bit quietly, and without pause in his cadence. Then, he extends a card. "If it becomes necessary, this card contains the number of my secretary. Should you ever speak with her again, this must be the first thing of substance you tell her." "She'll contact me in that situation?" "If she is capable of it." Spier says. "A full standard wage for a month's work should have been transferred to your credit account, young notary. Unless there is anything else you wish to take care of, that will be all." Knowing this might be his only chance to question the old Aerian, Vaz'kar doesn't hesitate. "While I am here, there maybe a separate issue you can actually help me with." That perks his Spier's interest. He leans forward a little, letting you get a closer look at his face, which Vaz'kar notices for the first time through the dark, bears some nasty scars, including a large cross-shaped one on his forehead. "Yes? What is it?" Knowing Owl-sight by reputation, Vaz'kar jumps straight to the point, "I am gathering information on a band of pirates. I have been led to believe you were attacked by them - any information you had on them would be of great use." A hint of irritation crosses Spier's face. "Ah. Those. I thought the police reports covered everything adequately, but I must have been mistaken." He closes his eyes and breathes in and out, slowly. "What do you want to know, notary?" "I wish to know if the pirates that attacked you are the same as those I was investigating. There are many pirates in the galaxy and I lost track of the specific group I was interested. You will have to forgive me though, I have not seen the police reports." The old owl's eyes twinkle with amusement. "A private investigator? I see...and who are these people you are looking for?" Slightly annoyed at the fact that Spier treated this as humourous, Vaz'kar snaps back, "I'm a Master of Knowledge, operating as a notary is just one way people make use of that. You have asked me to retain information, others ask me to seek it. The band I am looking for uprooted their entire Tribe-ship and retrofitted it into a pirate base. Does that match with the ship that attacked you?" "Yes. To the letter." He gives you an inquisitive look. "Who told you about this?" "Originally? A Lilimian who was attacked by them before you were. She asked me to seek information on them with the intention of retreiving something that was taken from her once they are apprehended." comes the response, Vaz'kar's tone softening once more. "Vaz'kar." He drawls out your name slowly, as if tasting each syllable. "I'm not a fool. I deal honestly only with those who are honest too. Why are you here?" Immediately Vaz'kar retorts, his pride stung by the old bird, "I am seeking information on the pirates that attacked you. Just because I am in your house, does not give you the right to insult me. I respect you as both an Elder and because of your reputation, but I will not bend my own honour." There's a long, long silence. Then, Owl-Sight smiles. "Everything we do seems so important when we're young, doesn't it? As you wish, then. I won't pry any further. Let me share one more thing with you, then: These scars..." he taps his face now. "Those pests gave them to me. They aren't a group to take lightly. Be careful if you go looking for them." Sensing the shift in tone, Vaz'kar again pushes for more, "One more thing, if I may before I leave. Do you know why they attacked you?" "I recognized one of them. He had dealings with one of my companies - tried to get a large military-class engine at a ridiculous price. My people kicked him out of the building." He laughs, quietly and a little painfully. "Vindictive little bastards, aren't they?" "Most people are when they think they can get away with it. What was his name?" "Triarca, I think. Oiram Triarca." "My thanks. Good day to you Owl-Sight." "Good day to you as well, lorekeeper. Take care." The Secretary is waiting for Vaz'kar outside the room. As soon as the door is closed, she turns to him and gives an inexpressive nod. "He approves of you," she notes. "Most people do," he responds with a flirtacious smile. "That's an awful lot of money for storing a string of numbers," mused Vaz'kar as with a huge flap of his wings he took to the air, "I wonder if Saker could unravel that..."
Certainly if anyone would be able to solve that riddle, the most likely would be the hacker he'd met back on Galeria. What could it unlock and why would it need to be independently stored? Owl-Sight would know the numbers at any point he'd need them. Definitely something to keep churning over, but also not worth wasting too much active time on. He resolved not to prioritise it in his thoughts - maybe it'd come to him in his sleep. The two remaining victims on Ur-Kal were still worth investigating, maybe Vaz'kar could determine if there was some reason that every member of a previously peaceful tribe moved into piracy. Of the two Hardan Muro was probably the least likely to be useful, most likely either refusing to talk. Better get that one over with then, Vaz'kar resigned himself to a wasted trip, but nevertheless headed towards the address he had uncovered. A light exploded in the distance, illuminating the sky and causing people to stop and stare for a moment before it faded away. Had something happened elsewhere? Or he could go find out what the hell that was. That seems far more important all of a sudden. Vaz'kar boarded the magrail and headed in the rough direction of the burst of light that exploded the sky. Picturing the worst, he imagined it to be some herald of the Wordtech freeing itself. Once he left the rail in around the right area he had little difficulty finding a destination - he may not have known where the light had erupted from, but everyone on the streets was talking about the cacophany of colour that had emerged from the Hunter's Guild. While no-one wanted to get any nearer, they were all happy to point him in the right direction, muttering and shaking their heads as he left. Approaching cautiously, not sure of what he was about to find, Vaz'kar was relieved to see the building was still standing. There were a number of people milling around the outside of the building and no-one seemed hurt in any way. Still more reassuring - if there was any real danger, people would have been running, yet those closest to the epicentre were treating it like a spectacle. With a peculiar looking shrug of his 4 wings, Vaz'kar flew into the Hunter's Guild. Entering the building to see a few people milling around, Vaz'kar turned his head around the room, observing the bald Fortunian behind the counter for a few moments, before scanning the rest of the entrance area, taking in a notice board, what appeared to be a waiting room and... Marek, Tank and ADAPA headed towards him. They looked like they were on the way out. Well, it made sense to him he reasoned - if anyone else was going to converge on the lights, it would be those he had travelled here with. That combined with the fact that he hadn't been in close proximity to them when they went off meant that if the others were closer, it would hardly be a surprise got here faster than he had. No point doing the same things twice, if they had picked anything up from the surroundings or any preliminary investigating, they'd tell him. "Hey gang. You don't seem particularly alarmed which I assume means you know what the crazy light show earlier was?"